Team and Member passwords are used to log into a registration form in order to register as a player to a club/team or as a team to a competition for a given season. 2. Click on Password Management. Skip to step 4. 3. 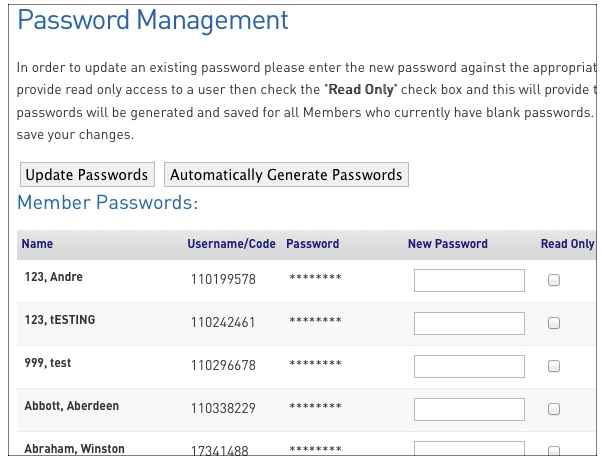 From the club level of Membership, click on on the Configuration icon and select Password Management. 4. Click on the level of the database for which you want to view or update passwords. 5. The clubs/ teams/ members (depending on your selection) are listed alphabetically. Find the relevant club, team or member and view or change their password. 6. If you would prefer to automatically assign passwords, click on Automatically Generate Passwords. The password fields will be populated with a random combination of letters and numbers for records that don't already have a password (it will not over-write existing passwords). 7. If you are obtaining a password for a club or team administrator, take note of the relevant password and send it on to the administrator. 8. Click on Update Passwords to save any changes. NOTE: Password details are not visible on the screen for security reasons. Members can have their passwords emailed to them from a registration form and administrators can reset them if required (as per the above process).